I’m delighted to announce I’ve been appointed to the International Journal of Management and Marketing Research (IJMMR) Editorial Board. It is a great honor and I’m thrilled to work with the IJMMR reviewing the latest global research in management and marketing. 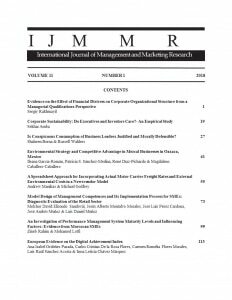 The International Journal of Management and Marketing Research (IJMMR), ISSN 1933-3153 (print) ISSN 2157-0205 (online), publishes high-quality articles in all areas of management and marketing. Theoretical, empirical and applied manuscripts are welcome for publication consideration. The journal is currently published once per year by The Institute for Business and Finance Research (IBFR). The journal overall acceptance rate is between 10 and 15 percent and the Journal uses blind reviewed process. This is a great Journal with important, peer-reviewed research in business. Birchtree Global supports business research because it can be much more predictive of results than anecdotal information. We encourage our colleagues and peers to look at the Journal and see the excellent research.